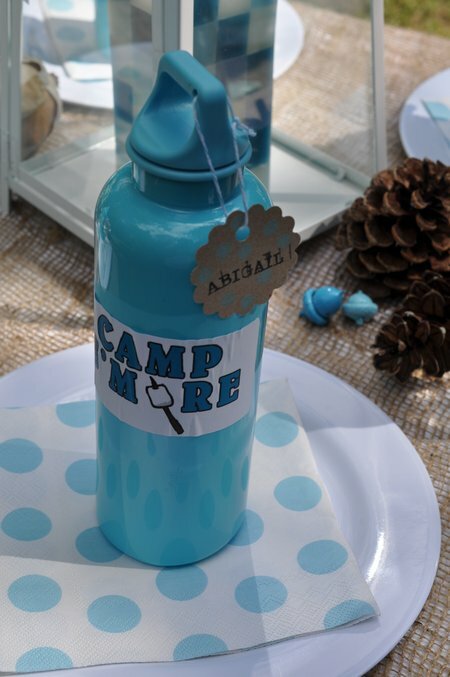 Over the weekend we celebrated my daughter Paige’s eight birthday with a camping themed birthday party. We called it “Camp S’more”, and had an amazing time roasting hotdogs, and making s’mores. 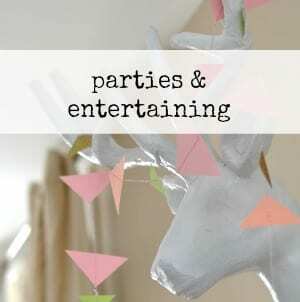 Today I want to share with you all the fun decor and details. The first thing I did was book a local campground – Glen Rouge Campground. It’s really close to where we live, but most of our guests had never been to it and lots said they always wanted to come in and see what it was like. Paige really wanted to roast marshmallows, and with all the by-laws around campfires, coming here was a great solution. 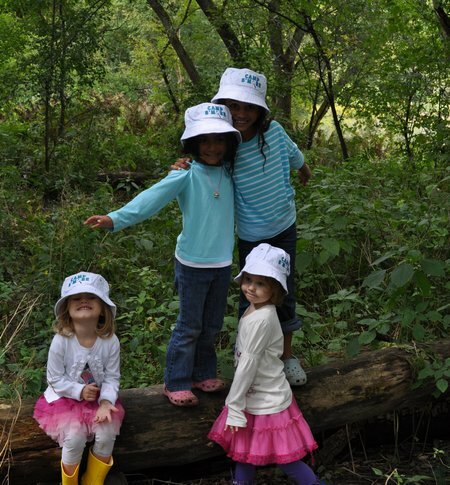 It also provided an amazing forest backdrop, and lots of fun for the kids! Paige’s favourite colour is aqua, so we decided to use that in all the party decorations. 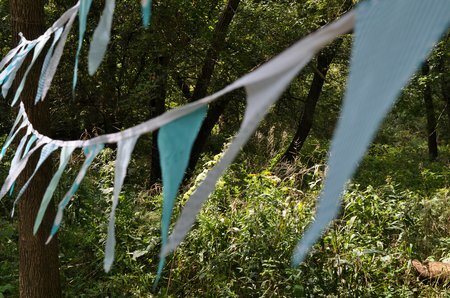 I sewed some fun bunting flags to decorate the camp ground. I used the same method and pattern that I used here, for the Father’s Day bunting. I love all the pretty shades, and textures of aqua fabric we found and how nice they looked waving in the breeze at the camp ground. I used the same material to wrap a letter “P” for our welcome table. I just ripped strips and knotted them together as I wrapped, and I love the rustic look it created. I also made a really simple picture frame from cardboard and some twigs hot glued around a picture to create a frame. 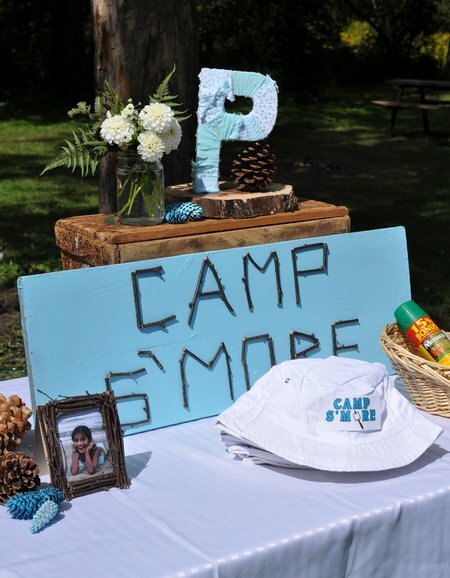 On our welcome table we had a large camp s’more sign. To make the sign I spray painted an old board aqua and used twigs to create the letters. It turned out so cute, and was really easy to make. 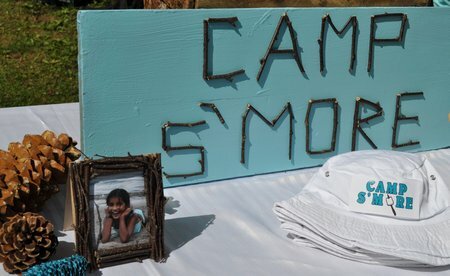 For party hats, I found white camp hats, and used a sticker to add our camp s’more logo. 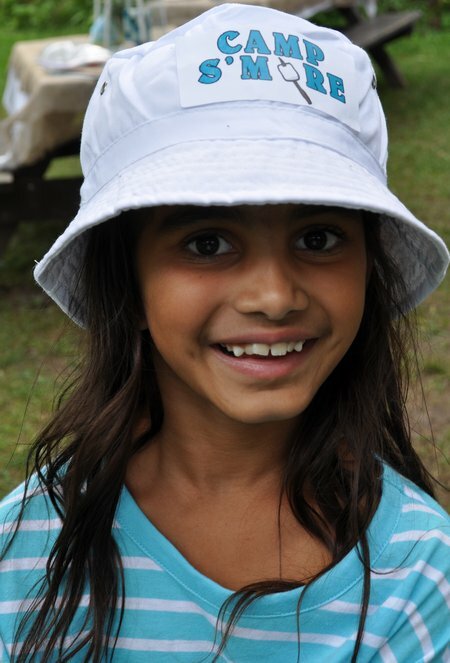 The kids looked so cute in their camp hats. On our welcome table we also added a basket of assorted bug sprays -it was a wee bit buggy! For the kids food table, we used the picnic table that was at the campsite. I covered all the tables in white table cloths and then layered burlap on top. It added a great campy feel. 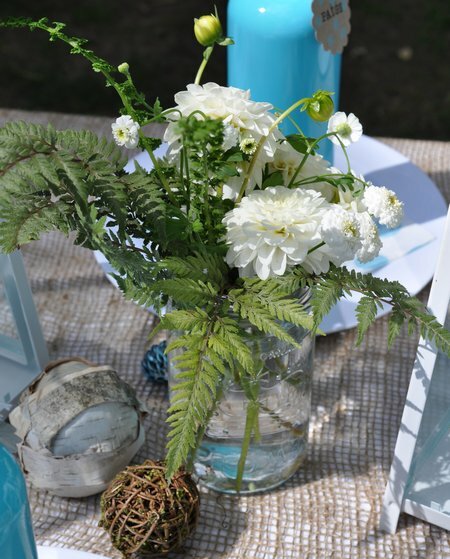 It is same the burlap I used for my burlap table runner here -the kind for gardening that you can find at Home Depot and for a great price too. 😉 It’s a pretty open weave, but laying over the white worked out great. 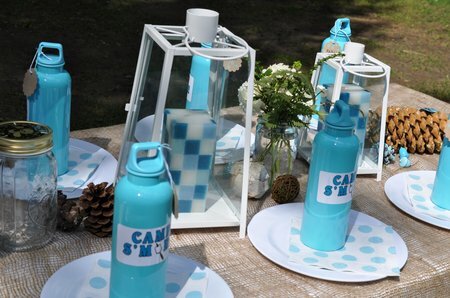 The water bottles were also from the dollar store, and I added the cute camp s’more logo with a sticker. I made the individual tags with card stock and stamps and tied them on with aqua baker’s twine. I love how all the little details turned out. For the centre piece I found these pretty lanterns from President’s Choice, I like that they are white and I’ll be able to use them a lot, since they could go with anything. My mom did the beautiful flowers for me. I asked her for ferns, to go with our camping theme, and some white flowers. We arranged them in mason jars, and I love how they turned out. I tried to create a runner effect with other natural elements. I used some twig and moss balls, pine cones, and birch balls. 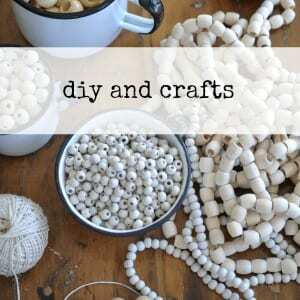 I made the birch balls by hot gluing birch bark strips to Styrofoam balls. Love how they turned out. 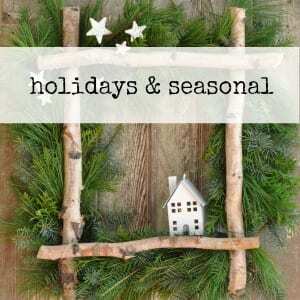 I also spray painted some acorns and pine cones – you know I am obsessed love spray paint! I wanted to add a few more pops of aqua on the table, but still keep the big things that I was re-using or hope to re-use in the future, neutral. It worked out great. We used another picnic table as a craft table, and place for adults to eat at. I did the centre piece of lanterns, flowers and natural elements on it also. There were a few little aqua butterflies tucked in too. 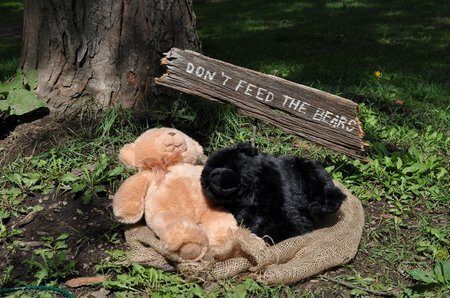 The fun detail that the kids liked was our “Don’t Feed The Bears” sign, made with an old board, and a white paint pen. It made everyone giggle. I’ll share all the yummy food with you soon, but today, here are the beautiful centre pieces from the food tables. On the drinks table I used one of the sweet DIY Rustic Tree Branch Cake Plates that I shared here. 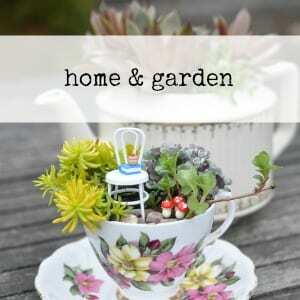 It held a sweet little birds nest, one of our gnomes that I’ll tell you more about later, and some flowers. For one of the other tables I used a upside down old crate to display an antique lantern -actually my Grandma’s old lantern that she used to use at night to go to the barn and do chores, nice to have a little bit of Grandma at the party. 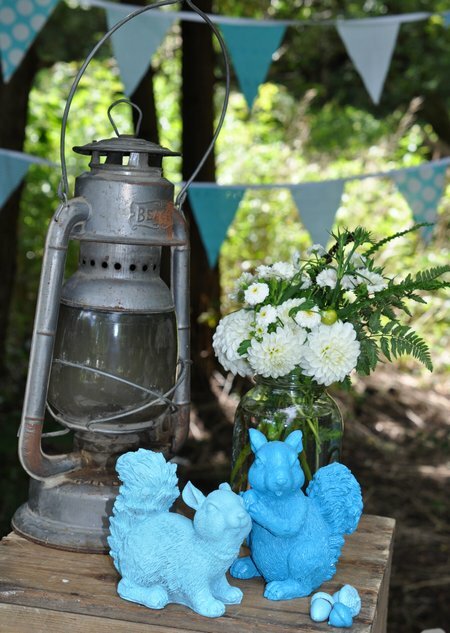 😉 I also displayed these cute squirrels. 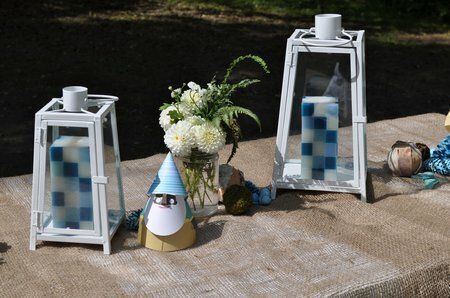 They started out life as slightly questionable garden ornaments, but after having a little encounter with Mr. Spray Paint they got to fulfill their ornament destiny as centre pieces! Seriously, aren’t they cute? 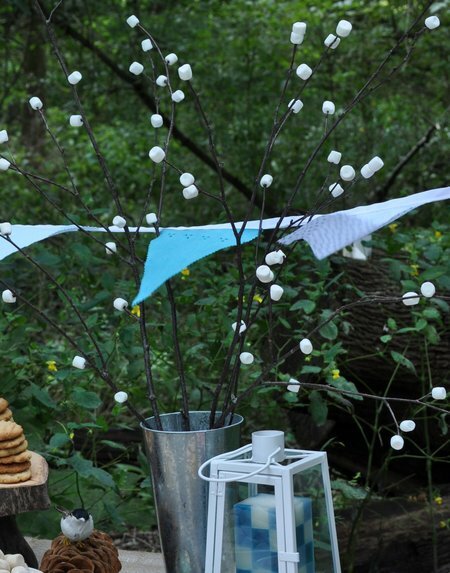 Without giving away too much of the s’more table, here was one of my favourites, a marshmallow tree! I can’t wait to share with you the gourmet s’more buffet, the camp s’more pintables, and all the fun activities this week. With a birthday party like this, life really is a party! 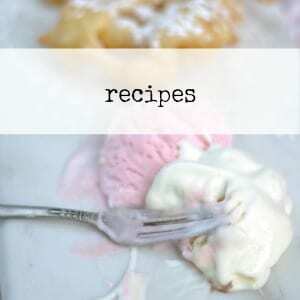 This post is linked up at Between Naps on the Porch, Tatertots and Jello, Tidy Mom and Whipperberry, and Craftberry Bush. 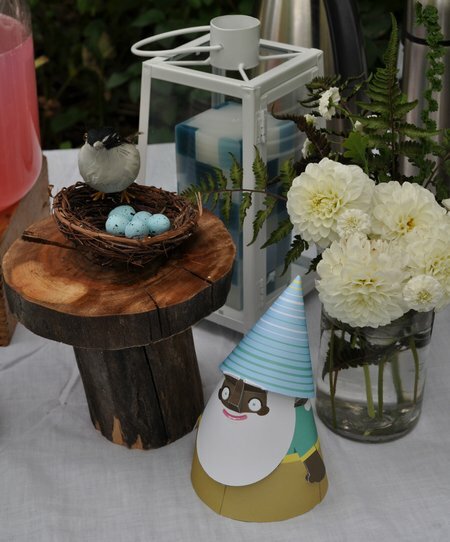 Love everything…especially the ‘Don’t feed the Bears’ sign and the repurposed squirelly centerpieces. Looking forward to seeing what you did with the activities. Question- Was the letter P made from styrofoam? 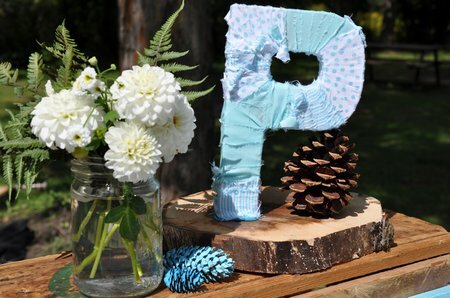 The letter “P” was made out of brown cardboard, I picked it up at Hobby Lobby when I was shopping in the states, but you might find it here at Michaels. This is such a great idea! 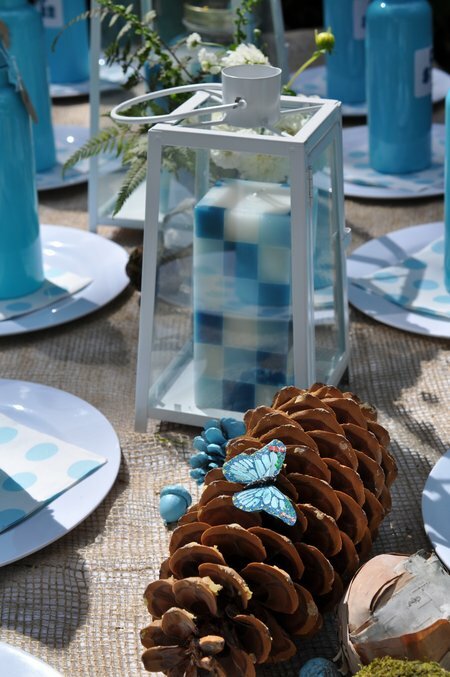 Love the color scheme and all the creative elements! Visiting from Happy Hour Friday! oh boy, I love this! super cute. pinning. stopping by from happy hour. hope you’ll stop by plumberry pie sometime! SO, so cute!!!!!!!! Oh, my gosh! 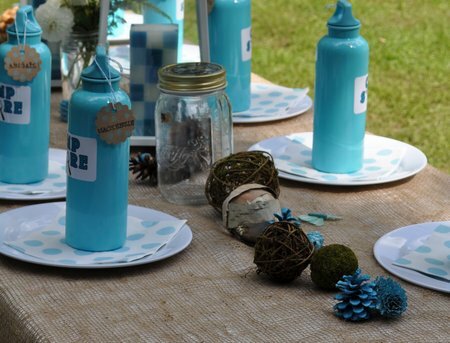 I love all the little details that come together to create such a thoughtful table setting! 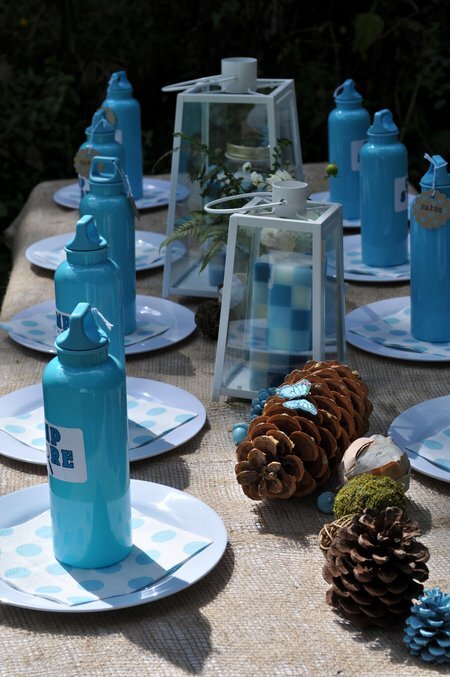 The aqua water bottles are a fabulous touch!!! 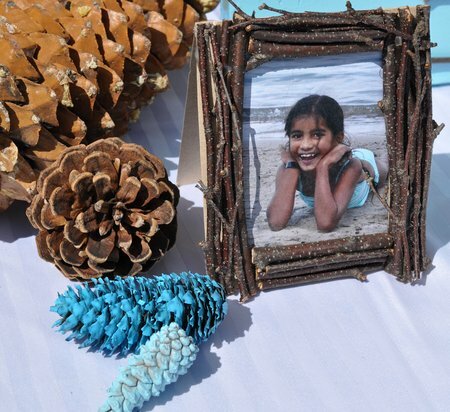 And such a cute, cute, cute picture frame! I LOVE the shape and design of the candles!!!!!!!!!!!! This is a super BRAVO table!!! Happy Belated Birthday to your lovely daughter! This looks like the best party ever! I LOVE your marshmallow sticks in the bucket! !